The new range-topping Golf R could be the next best thing to a production version of the 400-hp Golf R400. Originally, the new Volkswagen Golf was supposed to debut at the 2019 Frankfurt Auto Show in September before going on sale in December to coincide with the hatchback’s 45th anniversary. The new Golf’s debut has been delayed until next year, but the good news is we won’t have to wait as long for the more powerful GTI and R variants to arrive. Sadly, Volkswagen won’t be putting the 400-hp Golf R400 into production because it would be too expensive to buy and maintain. Its spirit could live on in a new model, however. According to Autocar, Volkswagen is developing a range-topping Golf R Plus model that would be positioned above the next-generation Golf R and rival the Mercedes-AMG A45 and Audi RS3 hot hatchbacks. It will reportedly utilize hardware and technology from the seventh-generation Golf R400 concept shown in 2014 and the Golf TCR race car developed by Volkswagen Motorsport. The secret model is being developed alongside the standard version of the new Golf R at VW’s R&D headquarters in Braunschweig, Germany. Insiders claim the new range-topping Golf R Plus will be the "most extreme and powerful Golf yet.” In terms of performance, the Golf R Plus is being compared to the R400 Concept, which could hit 0-62 mph in 3.9 seconds and achieve a top speed of 174 mph. Under the hood will be an Audi-developed turbocharged 2.0-liter gasoline engine that’s said to produce between 380 and 400 hp. In the new Golf R, this unit is expected to deliver around 320 hp. Power will be sent to all four wheels through a dual-clutch, seven-speed automatic transmission offered as standard. "We’re looking at introducing a new ‘halo’ performance model that would offer a level of performance beyond that of the next Golf R,” an insider said. It will also look considerably more aggressive than the new Golf R, with broader front wings that have been adopted in combination with a widened front track. At this stage, the new Golf R Plus hasn’t been given the green light for production, but it apparently has the support of VW boss Herbert Diess. 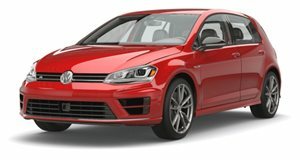 If approved, it will likely go on sale after the new Golf R in 2020 at a similar price to the Audi RS3, which starts at $54,900.